One thing I sometimes think about is the difference between binary and decimal numbers. This difference can be particularly interesting when it comes to sizing storage like HDs or SSDs. Manufacturers use decimal numbers to count the bytes of storage they provide. Then they describe them using megabytes (MB), gigabytes (GB), terabytes (TB) and so forth. But when it comes to numbering decimal versus binary bytes, using decimal sizes makes drives look bigger than they really area. As the scale of the units involved increases to TB and beyond, the discrepancy gets bigger along with the units. Decimal sizing inflates drive capacity. What this table shows is interesting. For one thing, for each unit (GB, TB, PB, and EB, which correspond to binary numbers 230, 240, 250, and 260) it shows the difference between a putative decimal number (Claimed) and its binary equivalent (Actual). This is also expressed as an absolute difference (Diff) and a percentage difference (%-age). 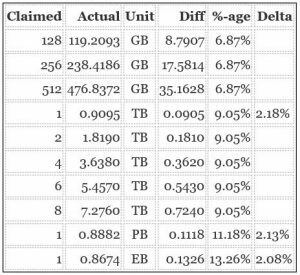 The Delta column shows how the growing percentage difference as we increase the scale of the units actually decreases (that is, from GB to TB, from TB to PB, and from PB to EB, or Exabyte). That’s a good thing because it means the increase is arithmetic rather than geometric or exponential. There’s an online tool you can use to work other numbers out for disks sized using MB, GB, and TB units. It’s entitled USB Hard Disk Real Capacity. But of course, it works for any kind of binary storage where buyers must convert a less-than-perfect decimal number into its binary counterpart. 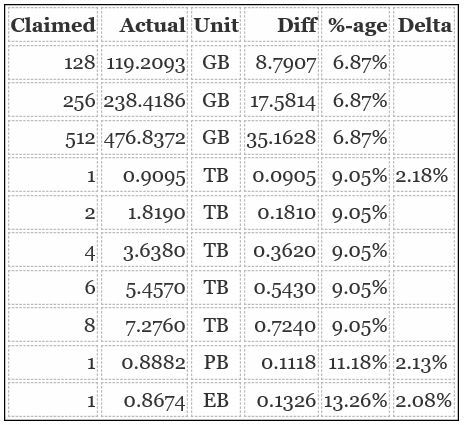 While you may or may not check it out, you can use the percentage numbers for each unit from Table 1 to reduce claimed disk sizes to the actual numbers you’ll see showing up in Windows Explorer (or its platform equivalent, such as the Finder for MacOS, and file/directory commands for Unix/Linux).